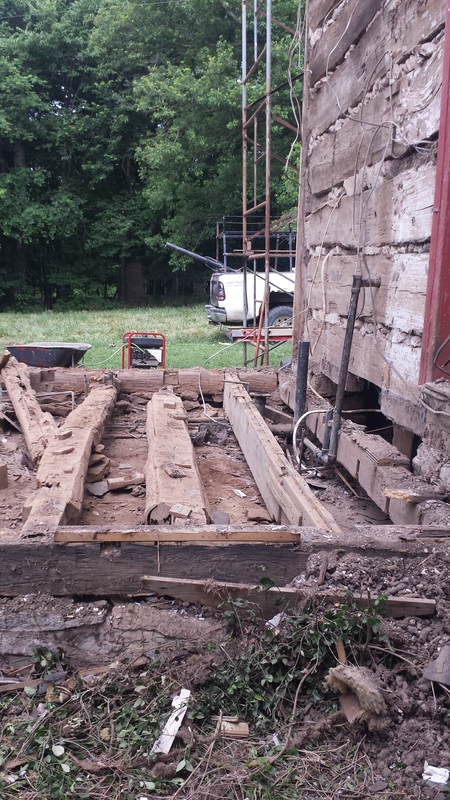 The summer has seen the beginning of a project that I have been working on for a long time - the restoration and renovation of a 17th-century log cabin in Central Kentucky. This project is of particular interest as it has been in the owner's family continuously since it's construction, and there is a wealth of archival material available, from details of purchases of materials to early photographs. The cabin is a classic "saddlebag" style structure, with two log cribs and a masonry chimney in between. It was built in 1817, one of the first permanent structures on this farm. In its original incarnation, it seems to have been rough-hewn and whitewashed on the outside, with chinking between the logs but little else. At some point a small shed addition and a front porch were added - the shed currently contains the plumbing and services. 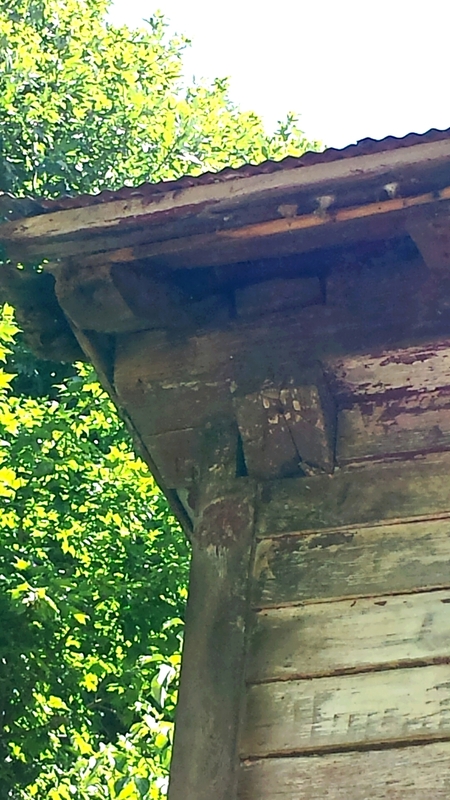 In the 1950's, cedar clapboard siding was added, perhaps out of concern for the longevity of the logs. As a whole the structure is quite sound. Despite what seems to be a perfunctory limestone footing, the log cribs seem to be flexible enough to have moved without damage. The addition of the siding protected the logs themselves from the elements and kept rot and water penetration to a minimum. A lime whitewash seems to have been applied to the interior and perhaps the exterior, which may have protected the logs as well. The initial part of this project involves stabilizing and repairing the existing structure. The siding and metal roof are in very good shape despite years of neglect (they structure was last painted in the early 1980's). Though they are not original to the structure, they will be retained and patched where necessary. The shed addition will be removed to make room for updated services and the addition we are designing. 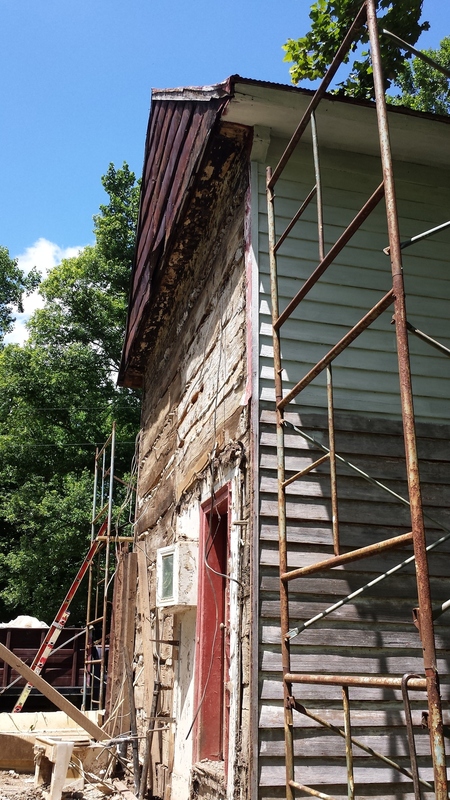 Phase IV Contractors, a Lexington construction firm specializing in restoration work, has been running the job, working on the clapboard siding, replacing damaged boards and generally tightening up the shell. They will be replacing the windows on the ground floor with 6-over-6 double-hung wood windows.